Giant Sequoias at Calaveras Big Trees State Park. One of the distinctive natural tourist attractions in California is the redwood trees such as the coastal redwoods or the giant sequoias. The coastal redwood trees grow higher than a 30-story building and can live more than 2,000 years. The giant sequoia can live more than 3,000 years and is the largest tree on Earth with trunks that grow as wide as 30 feet. 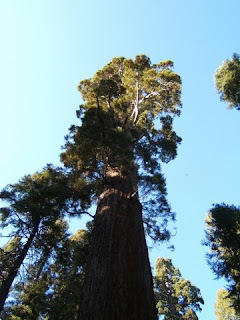 The giant sequoia is also known as the Sierra redwood and is found in only 75 groves in California’s Sierra Nevada. On June 15, the Conference Committee of the California Legislature voted to remove all general fund support for the California State Park system. The removal of funding for the parks is due to a state budget deficit of more than $24.3 billion. This measure would require the parks to close. There are 220 California state parks that could close. Many of these parks contain the treasured redwood trees. Besides the redwood trees, the California state parks are great destinations for both state residents and tourists alike to visit. If they are closed, California and all California travelers will lose the opportunity to visit these wonderful and beautiful locations. Some of the state parks may be taken over by the National Park Service. Save the Redwoods League is one organization that is trying to stop the closure of the state parks by proposing an alternative parks funding plan. You can help try to save the California state parks by supporting the Save the Redwoods League, the California State Parks Foundation, or other organizations dedicated taking part in The Save Our State Parks (SOS) Campaign. If you are a California resident, you can contact your state legislators and tell them to keep the parks open not only for use by California residents, but as vital tourist attractions, as well. Sea Otter Bill Passes House! Urgent Help Needed for Sea Otters!